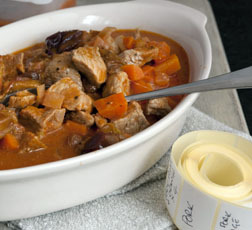 This works well as a family dish as the children like the sweet and sour flavours. The pork is beautifully succulent and this recipe works just as well if you use turkey meat. Serve with mash, baked potato or rice to soak up the juices and if you don’t have plums you could use apricots, apples or even a 400g can of tinned pineapple or peaches. Preheat the oven to 200C (400F) mark 6. Heat half the oil in a flameproof casserole dish and cook the onions and carrots for about 10 minutes. Remove with a slotted spoon. Season the meat with black pepper, add to the pan in batches, and fry on all sides for 2-3 minutes over a hot flame. Mix together the orange zest and juice, tomato puree, vinegar, sugar, mustard and 400 ml of water. Pour this over the meat. Cover and cook in the preheated oven for about 30 minutes. Take the meat out of the oven and add the sultanas or raisins and plums. Continue to cook for a further 45 minutes or until the plums have collapsed and the meat is piping hot. To freeze: Complete this recipe up to the end of step 5. Cool, transfer to a freezer proof container, label and freeze up to 3 months ahead.To use: Thaw overnight in the fridge, then transfer to a saucepan. Bring to the boil on the hob until the meat is piping hot.